Nigeria’s youth technology entrepreneur, Phemmy Adeola Alade, has introduced a new learning device into the market that he says will revolutionise the way children learn by adding fun to the process of education. Alade, nominee for 2013 Abuja Young Entrepreneurs award, told Premium Times in his office in Abuja that the new device which is a complete notebook, is an electronic wifi android tablet, that can be used to access information via text messaging and can also allow access to learning in audio, visual and interactive forms. Tagged the Vivlio, the tablet is a cute stylish 8 inch handy computer, stocked with digital multimedia information that would aid in fusing education and the learning process of students with technology now acting as a playful companion. Mr. Alade, initiator of Pliris Mobile Limited, says that he is committed to contributing his quota to empowering Nigerians by providing enterprise –wide solutions, information technology and telecommunications solutions. He says his ultimate vision is “to provide turnkey mobile solutions for citizens of Nigeria and Africa”. Students carrying a whole library in a portable form would be a proof of how Nigeria is adapting to the global change in technology, says Mr. Alade who reasons that the Vivlio is an opportunity for people to experience mobile learning at really affordable cost. Sounding excited he says, some other features of the Vivlio are 1.7 quad core processor, 2Gb ram, dual camera, android jelly hand writing recognition and lots more. The specs are available on www.plirismobile.com. This project is intended to ease access to information centers by removing the strain of tuning to live content radio stations via the internet, using mobile phones and other tech devices. With this device, Mr. Alade expects the geographical barrier in radio broadcasting to be breached, and since radio broadcast reaching a wider audience utilizes the internet, he says this breakthrough will be achieved through the streaming service and deployed through major mobile devices. The fair complexioned six-footer Pliris entrepreneur is consumed in a world of digital gizmos. He told Premium Times of a handful of other devices in the work like the digital receptionist that promises to bring a “dynamic office experience to the working environment.” In his words, “it is more than a receptionist”. He also talked of the Pliris texty platform, which provides free text messages from a service provider to the public. With this, texting just got useful, it is about getting information out there to those that would need it. 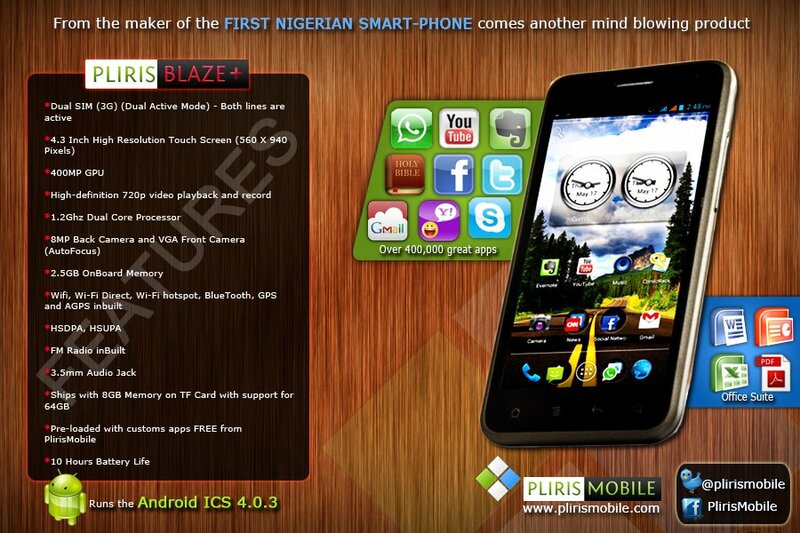 Then there is the Pliris Blaze+, a mobile android phone. This is a smart phone designed with the Nigerian in mind affordable and very functional; he was reflective at this point and really enthusiastic about creating usable cultural adaptable solutions for the country.